Dragonforce. This is one of most prime examples of “love ‘em or hate ‘em” that I’ve seen in metal over the past few years. Some are quick to say that they are cheesy, over the top, and exactly what is wrong with the power metal genre today. Others will cite their enormous ability to combine ferocious speed, melodies, and blistering guitar work in such a way that no other band in the genre can. Inhuman Rampage will do nothing to eliminate this division or to win new fans. However, I am confident that this third album will confirm Dragonforce’s elite status in the power metal genre for fans of the band. Inhuman Rampage isn’t a major progression over Sonic Firestorm, although there are some differences. First, this album took longer to jump on me than did Sonic Firestorm. I’ve been listening to this album quite a lot these days, but it wasn’t until after a dozen or so listens that I really got addicted, playing it over and over again. Don’t take that as a knock against this album; just an observation that it is a bit different. The melodies aren’t as instant, but the guys deliver even more blast beats, and more technicality this time around. Wait, did I just say that Dragonforce got faster? Yep, they did. This has got to be the fastest power metal album where the songs are still coherent and catchy. As far as the melodies not being as instant on this album, I think that partially has to do with ZP Theart’s vocal delivery on this album. He has a great sense of melody, and sings with lots of emotion, but he is restraining himself a bit as far as range goes. On Sonic Firestorm, there are times where Theart could seemingly carry the entire song himself with the extra range he used. On Inhuman Rampage, his voice combines quite nicely with the guitars to create memorable melodies, but his voice doesn’t stand out as a main ingredient this time around. Again, that’s not a knock of any sort against the album. It’s simply a difference worth noting. Of course, the songs themselves on this album just have a thicker texture, so there is a lot more than just melodies for you to digest as you listen to this album. At the end of it all, each and every song infiltrates your memory and demands to be replayed, and so this approach works. The length of each of the songs are mostly in the seven to eight minute range, frequently using odd time changes to give the song a fresh dynamic. So, as I said before, be prepared to give this album a few spins to absorb the entire wall of sound that they are launching at you. 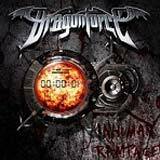 Despite a few differences with this album, the core ingredients of Dragonforce’s sound are as strong and prolific as ever. For my ears, no band blends sheer speed, melody, and technicality as well as Dragonforce. On each of those points, the band hasn’t missed a beat whatsoever with this album. As mentioned above, the melodies aren’t as instant, but once they do hit you, you’ll be hooked. Simply put, Herman Li is just ridiculous on this album. His solos and leads are still lightning fast, but somehow more intricate than on past Dragonforce albums. I like the sudden, uncommon time changes that are thrown around from time to time. That serves to keep a 7 or eight minute song from becoming stale or predictable. Also, it adds a thicker dimension to the music, meaning that you will need many, many listens to absorb it all, which I touched on above. As for the drumming… whew! This is some head pounding stuff, folks. The blast beats are more present than ever before, and they are perfectly timed. On the debut album, the drumming was also manic, but it sounded to me that the drums were getting ahead of themselves at times. Fast forward to Inhuman Rampage, where the drums are faster, yet sound incredibly tight and precise. The drumming doesn’t sounds like the same catatonic machine gun beat played for an hour straight, either. While maintaining break neck speed, there is a very pleasing amount of variety to be heard from behind the kit, further ensuring that there is never a dull or repetitious moment to be heard. The production also sounds a bit more slick and polished, thereby helping each rapid drum beat to sound crystal clear. Also of note, the keyboards are used a bit more heavily on this album than what we’ve heard from the guys in the past. I wouldn’t call the keyboard textures dominating in the least bit, just more noticeable. Actually, I like what they’ve done with the keyboards, sound wise. There is no complex, proggy sound to the keys, but instead and curiously refreshing, straight forward 80’s to early 90’s retro feeling. This is especially evident on the obligatory ballad, Trail of Broken Hearts. At any rate, the keys contribute a pure supplemental role, as the guitars are the dominate facet of the sound, and with an exclamation point. Speaking of ballads, this is a good one, just as are the band’s other 2 ballads (one per album seems to be their blueprint). I’m normally not a fan of power metal ballads, but Dragonforce show their ability to write good songs, fast or not so fast. Still, I’m glad that the guys place no more than one ballad on their albums; speedy tracks are obviously the bands strong point. However, they make the ballad a quality track unlike most power metal bands, cough…Helloween, Stratovarius…cough, which are usually filler tracks at best. As I write this review, the ink is barely dry on my Best Of list for 2005. Only 2 days into 2006, it almost seems like I can fill in the top spot for 2006 as well. Still, there are 363 days left in 2006, so I don’t want to get too ahead of myself. However, Inhuman Rampage kicks the new year off with some serious power and intensity. Fans of the band and fans of uplifting power can buy this album blindly. With this third album, Dragonforce picks up right where they left off with the ground breaking Sonic Firestorm album. With two fantastic albums in a row, I feel that Dragonforce have cemented themselves as a top notch act in the genre. Inhuman Rampage sets the bar very high for the upcoming year. Upon quick glance at some upcoming 2006 releases, it appears that we are in for a monster year of quality metal releases!